From David Page, Director of Rugby : Good afternoon and welcome to Fowlers Wells. As Chobham Rugby Football Club celebrate it’s 50th Season can I extend a very special warm welcome to the Players, Coaching staff, Medical team and Alecadoo’s from our visitors today Chiswick. Our last game back in March saw us lose at the Hands of the Thames based side 31 points to 19 and this was a major turnaround from the 41 to 10 victory we had at Fowlers Wells in the November 2015. The change in results shows how tight this league can be and on any given day with a fair wind anyone can beat anyone else. I hope that you all enjoy your visit to us today and hopefully you will not spoil our 50th Anniversary celebrations. Chiswick opened their season with a loss at home to Cobham 51 points to 11. Our opener at Gravesend was a little closer but we also went down 31 points to 17. We begin this week on a road of the Three C’s – Chiswick, CS Rugby (Civil Service) and then the Chobfest weekend (24th/25th September) at Home to Cobham. We will hopefully begin to today with the first of Three W’s against the Three C’s. Well it has been a long long Summer and it seems that the Rugby has never stopped, it certainly has not stopped at Mighty Chobham as our Touch Rugby squads have gone from Strength to Strength competing and beating clubs of a much higher profile and with a much longer history than ours. Well done to all those involved it has been a pleasure watching the action and reading the results. As the new sign up’s for the Mini and Juniors begin over the next few weekends I would like to pay tribute to all those involved right through the club, the success of giving these young Boys and Girls an outlet for their fun does not just happen, it is with hard work and dedication to all the Age group managers, Coaches, Parents and the enormous amount of work put in by people like Mini’s Chair Ian Woodley and Junior Chair Sean Wickes, I wish you luck in the coming weeks as we see the numbers of children playing and enjoying this great game grow and grow. On the Youth Front I would like to welcome to the Club our new Community Rugby Coach – ED WYNNE – He will take over the day to day running of the club’s community programme as Liam who has worked so tirelessly in the past moves over to become the manager of the South West Surrey Rugby Academy that will be run out of the club at Chobham. Ed and Liam will be working closely together. This season see’s us entering the field of Mixed ability Rugby – this exciting new opportunity for many people will be a focus for us this season. Mixed Ability Rugby kicks off with a game between Chobham Select XV against Letchworth Braveheart’s on Friday 7th October with a 7:30pm kick-off. Please come along and give your support! Well on to the Seniors, we now have in place team managers for all sides – Tony Seers remains Team manager for the 1st XV, working alongside Ryan, Tony Paul and Myself, Erica Brooks will now manage the 2nd XV and work with Newly appointed 2nd XV Had coach Chris Dodd (who is also the clubs Coaching coordinator), We then have the Family affair of Catrina Campbell Managing the Dev’s working alongside Hubby and Head coach Andy Campbell, the Crusaders will be led from the front by Brian Robbings, all overseen by Neil Gadsby as Senior Chair, Itor as Club Captain all working with me to produce – The greatest, Friendliest, fun loving rugby club in Surrey. –Thank you to you all, without you, we could not even dream of that happening. As mentioned we are in our 50th Season and you will notice a change of playing strip from that seen in recent years – we have gone back to our roots and have donned the same shirts worn by the club back in 1967 – This will feature all season and will along with other special 50th Anniversary merchandise be one of the many features we will see and enjoy in the season. We have a CHOBHAM 50th Working group who have a number of events planned – It all starts with CHOBFEST over the weekend of the 24th/25th September – So watch out for the information and be sure to join in the fun and share in the anniversary celebrations. 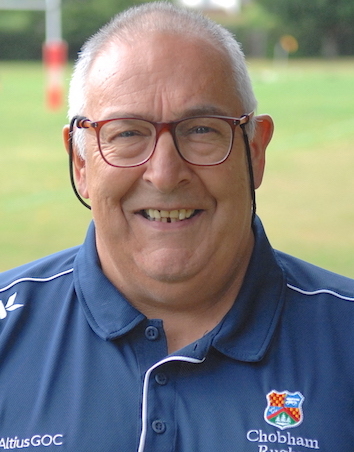 I wish you all great season of watching Rugby at Fowlers Wells and hopefully you will share our games away from home should you fancy a trip to Kent or the South Coast.